3 years on, still going strong. If you’ve visited it recently it’s not hard to tell why. 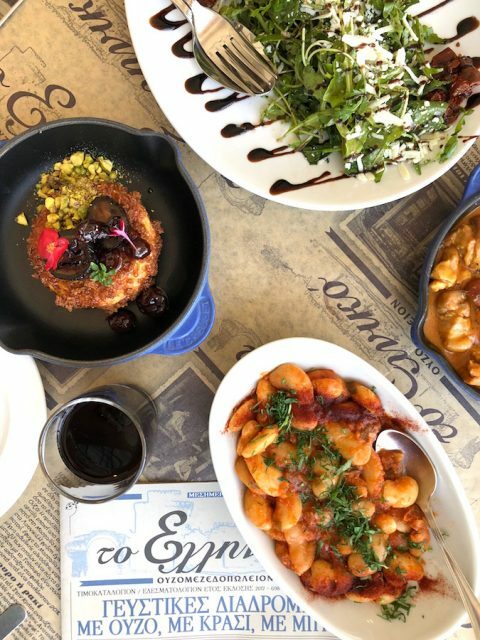 Probably the only modern Greek restaurant in the capital with dishes that will keep one interested for more than a few visits. Comfort food at its best! 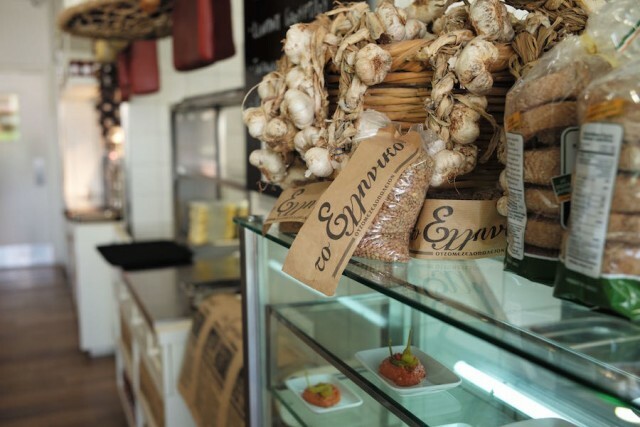 The Greek element is all over the place: the white chairs, the herbs that are hanging from the walls, the tins and jars that decorate the surroundings and of course, the menu and food presentation. Some elements hint at the classic but it holds a buzzing, easy-going vibe. I particularly liked how, although it’s quite big in size it doesn’t feel like it. The food? Greek, with a hint of creativity. 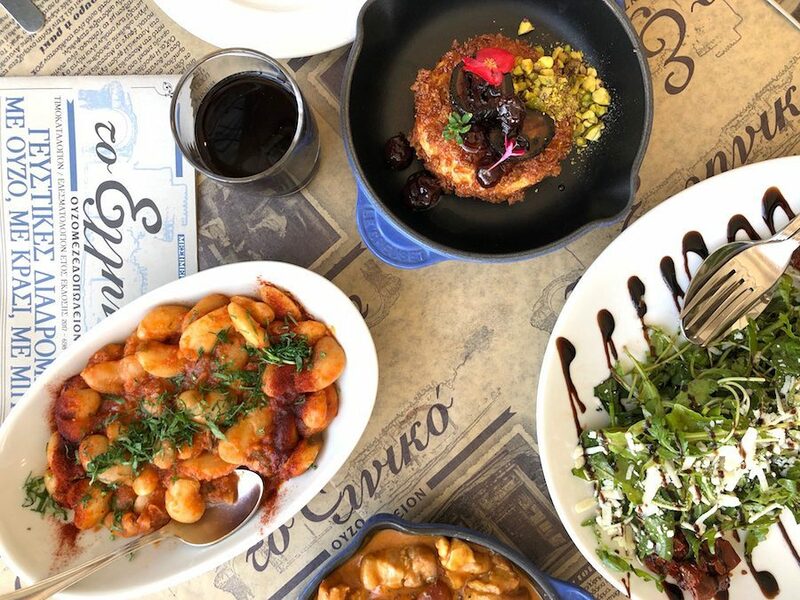 The selection is just right as it has a list of traditional dips and salads, a very tempting list of starters and two selections of main dishes: meat/fish on the grill and “oven cooked” dishes (“magirefta”). The decent sized starters were a great start to the meal. 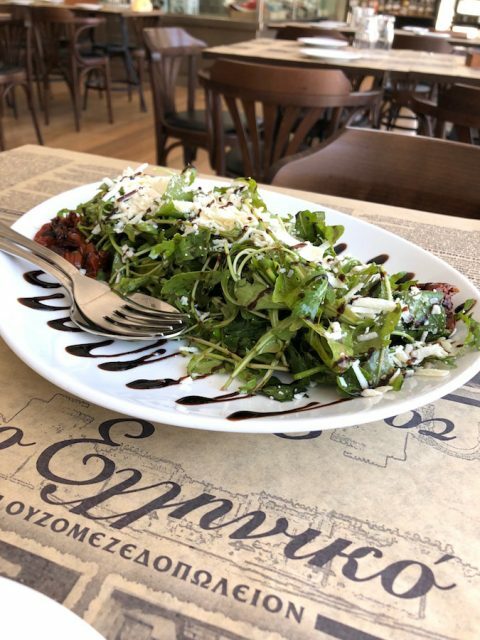 The “Kipos tou Pappou” salad (Grandpa’s garden) with rocket, savoury Greek cheese and balsamic vinegar was more than refreshing, exactly what I needed in a hot summer day. 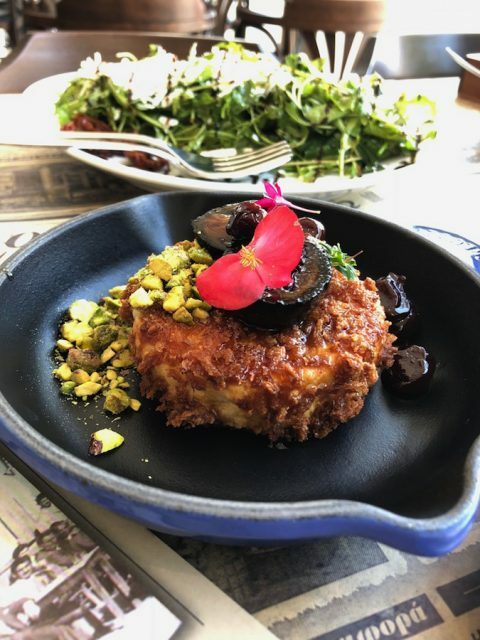 The melting Greek cheese in a crispy crust served with sweet “karidaki” and pistachios was a tasteful combination of sweet and savoury while the “Gigantes Prespon” (Greek giant beans) were well executed. The touch of paprika perfected the whole dish and showed how spices can bring out simple flavours. I am not a fan of grilled “calamari” but I can tell why the chef recommended it. This one was stuffed and served beautifully with seasonal herbs. A great dish where simple becomes adventurous. My favourite dish was the stuffed “mpifteki” served with tomato sauce. 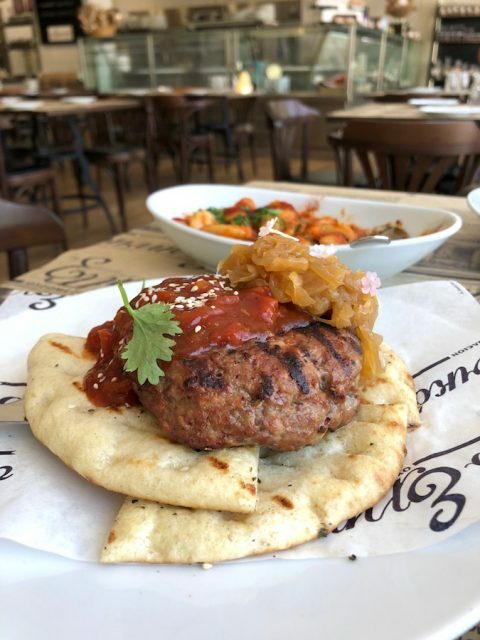 I don’t want to call it a “burger” because the spices used in a Greek “mpifteki” are somewhat different, more onion, more parsley, more Mediterranean. 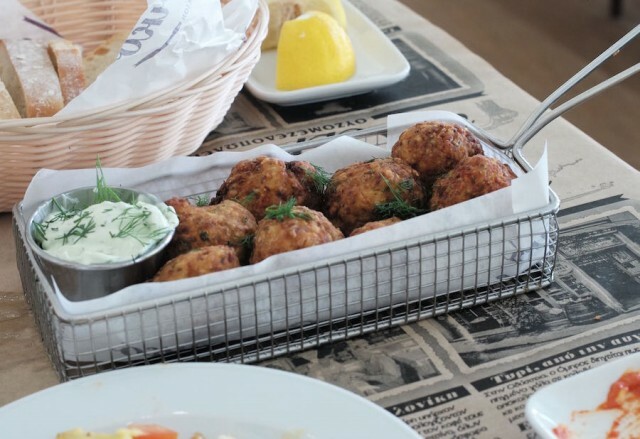 The fried zucchni balls (“kolokithokeftedakia) with fetta cheese were crispy and another must-have. I also loved the augergine rolls with “soutzoukakia”, a rich starter with a lot of herbs and a familiar “Greek” flavour, if you know what I mean. A meal is not complete without …dessert. The light cream with “masticha” (mastic), with burnt sugar on top was good as a texture but not my favourite as I am not a fan of mastic. 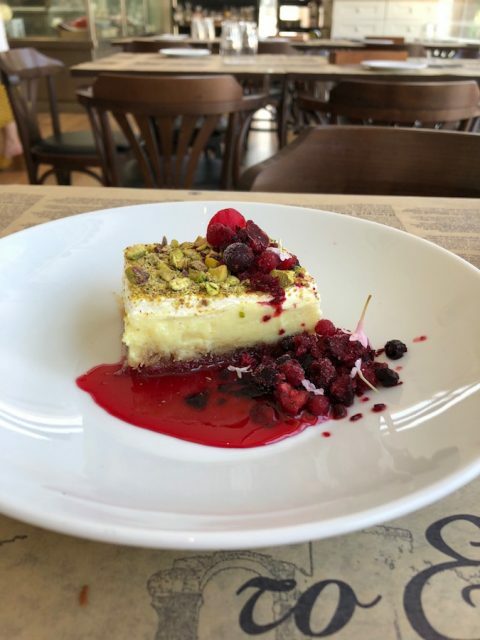 The “politiko” that was simply a syrup covered sponge cake topped with cream was fantastic, while the “ekmek kataifi” served with a light berry sauce was perfect for a modern Greek meal, my favourite dessert out of the selection. My recommendation is choose a variety of traditional dishes (like the zucchini balls) combined with some more creative, rich dishes (like the cheese with “karidaki”). Overall expect a good value for money at around 25-30eur per person for A LOT of food with wine.